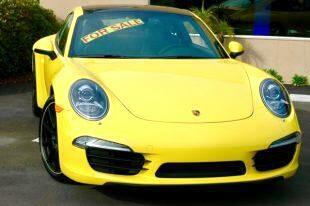 Moon Roof.--This 2013 Porsche Carrera with a racing yellow exterior and a black leather interior is a two owner California car and has only 18,834 miles on the odometer. It has been garage kept and properly serviced since new.---Pre-purchase inspection report by our Porsche Factory trained technicians available to review. ---Clean Title and Carfax.--Hi Tec Automotive has been servicing and restoring Porsches in the San Francisco Bay Area since 1986. This is our passion and we treat every Porsche as if it were our own. Our Porsche factory trained technicians go through an extensive point by point pre-purchase inspection on all of our Porsches before being offered for sale.